This is a panorama I made from 30 single images, converted into HDRs and stitched together the 10 HDRs with PTGui. 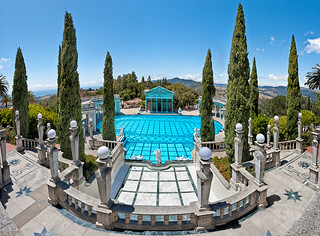 The Neptune Pool at Hearst Castle was rebuilt three times to suit its owner's tastes. Its centerpiece is the façade of an ancient Roman temple that William Randolph Hearst had purchased and imported to California. Hearst Castle is a National Historic Landmark mansion located on the Central Coast of California, United States. It was designed by architect Julia Morgan between 1919 and 1947 for newspaper magnate William Randolph Hearst, who died in 1951.